Smart meters have been touted as the wave of the future and a great tool for us to be able to monitor the electricity usage of every device in our homes. Yet the corporations and utilities promoting them are going all out to keep you in the dark around the danger of these meters. The excellent, award-winning documentary, "Take Back Your Power," (available free at link below) reveals how we are all being subtly and not so subtly manipulated into compliance. The film starts off with two riveting segments. First up is captivating footage of a county commission meeting where commissioners pose hard questions to a PUC (public utility commission) representative on whether the utility had looked into the health risks and dangers of smart meters. The utility representative tries to avoid answering every time, yet thanks to hard-hitting questions by several commissioners, it is all too clear that either the PUC had not done any safety assessment, or even worse, did the studies and was concealing the incriminating results. After this eye-opening scene, the documentary shifts to startling video clips of two cases where individuals had their homes broken into by workers ordered to put in smart meters, even though the customers didn't want them. One guy actually caught the utility worker breaking in his door on film using his cell phone video. Numerous cases are also presented of individuals who became ill very likely as a result of the electromagnetic radiation put out by these meters. Great ideas are given at the conclusion of this compelling film on what we, as citizens, can do to expose what is going on and stop the forced implementation of this dangerous technology. Don't miss this vitally important educational documentary available for free viewing at the link below. Note: A USA Today article on this revealing documentary is available here. Contact your media and political representatives to inform them of this vital information on the dangers of smart meters. Urge them to study and bring publicity to this important topic. Invite them to watch this documentary and explore the links suggested. Read concise summaries of key mainstream media news articles on the dangers of cell phones and wireless revealing major corruption and manipulation. 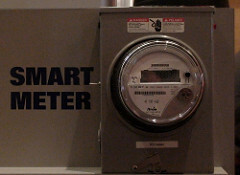 For concrete measures you can take to get the word out and avoid the dangers of smart meters, see this website. Spread this news on the dangers of smart meters to your friends and colleagues, and bookmark this article on key social networking websites using the "Share" icon on this page, so that we can fill the role at which the major media is sadly failing. Together, we can make a difference.